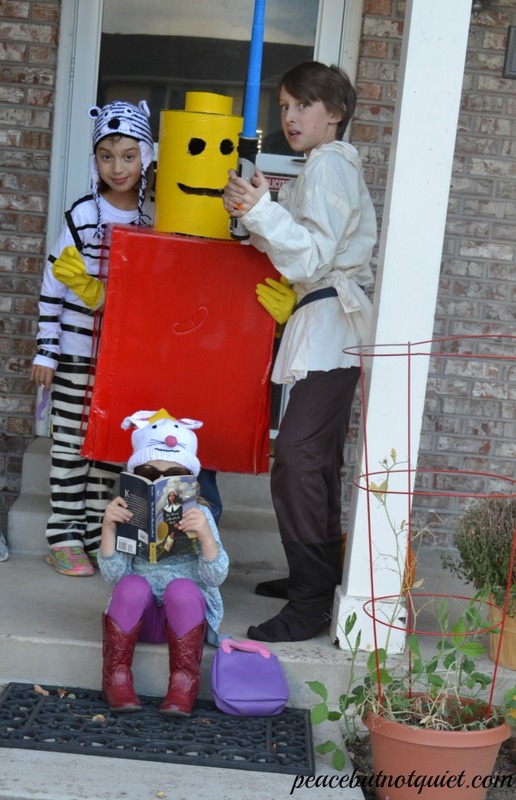 So last Halloween, I had a crew of minions, a Gru, and a Lucy. This year, I wanted to do another family theme. With four kids, there are so many possibilities! The Chronicles of Narnia children (though I changed my mind when one of the kids suggested I be the witch), the three little pigs and the Big Bad Wolf, Goldilocks and The Three Bears, the crew from Frozen (but only if the boys agreed to be Ana and Elsa. They did not.). Instead, I got this. A white tiger. A Lego minifig. Obi Wan Kenobi. And Lilly with her Purple Plastic Purse. The funny thing is, each of these costumes totally suits each of these kids, their personalities, and their phases in life right now. Sometimes you just gotta let people be themselves. This post is part of 31 Days of Connecting Simply. You can read the rest of the series here.